A drama based on the infamous incident that ended one life and one Presidential campaign, Chappaquiddick is a faithful recreation of the murky story, but remains emotionally stranded. It's 1969, and Senator Ted Kennedy (Jason Clarke) is the only surviving Kennedy brother. He is mulling a future run for the presidency and trying to convince Mary Jo Kopechne (Kate Mara), a secretary who worked on his brother Bobby's campaign, to join his team. With his entourage, including cousin and fixer Joe Gargan (Ed Helms), Ted spends a day on Martha's Vineyard to compete in a yacht race. After a party that evening in Chappaquiddick, a despondent and slightly inebriated Ted drives with Mary Jo towards the ferry terminal. He takes a wrong turn, drives off the road on a narrow bridge and the car lands upside down in a water channel. Ted somehow extricates himself but Mary Jo drowns. Despite the pleas of his team members Ted is slow to report the incident. With his presidential ambitions in tatters, he turns to his ailing father Joseph Sr. (Bruce Dern) for help, and a massive damage control machine kicks into action. 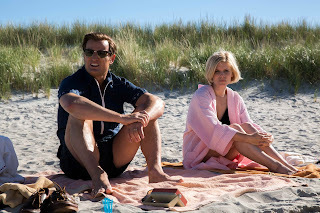 Directed by John Curran, Chappaquiddick covers familiar ground in workmanlike fashion. The tragedy that cost the life of a young woman and ruined the aspirations of the youngest Kennedy has always been shrouded in controversy thanks in part to the subsequent intense spin unleashed by the Kennedy lawyers, and the film does not try to fill in the unknown blanks. How Kennedy made it out of the car, why did Mary Jo not escape the same way, how much effort did Kennedy put into rescuing her and why Gargan and others thought that leaving Kennedy on his own after the incident could possibly be a good idea are all questions that remain submerged in the dark waters below the bridge. The film does try to delve into Kennedy's state of mind, a combination of shock, denial, alcohol, and disorientation presented as a potential explanation for his erratic attempts to first avoid confronting the facts and then try to hide some of the truths in the immediate aftermath. The few brief scenes showing the interaction between Ted, always perceived as the weak son, and his father Joseph, frail and near-death but still carrying frightfully domineering power, emerge as highlights. The performances are serviceable without scaling any heights. 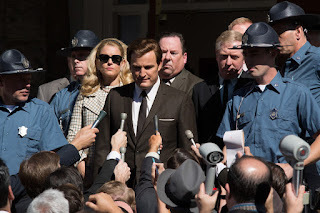 The film's tone is steady, Curran not searching for contrived peaks of emotion, and Jason Clarke is suitably introverted but still revealing flashes of the Kennedy entitlement running through his blood. Chappaquiddick is a story of the rich and powerful navigating a crisis, seeking an outcome that only the privileged can aspire to. In refusing to condemn or lionize Ted Kennedy the film makes its points, but does it quietly.